THE NOTION OF REGIONS has been central to geographic thinking, first because of the importance of the observation and its corollary, and second because of the classification in classic geography emphasized by the empiricism and primacy of the field survey. The term region originates from Old French and stems from the Latin regio, meaning “direction and district,” and from regere, meaning “to rule,” or direct and thus give the dimension of political space. Contemporary geography considers the region as a spatial entity of a middle size (between the local and the national level), which may be different from one country to another and one period to another. Regions can be a political entity used, for example, by the United Nations, which divides the world in a certain number of regions with variations in size. It is under this term that it is possible to designate a group of states, or a continental group such as the MIDDLE EAST or Southeast Asia, and also to refer to regional powers or regional conflicts. In addition, the term has changed from the traditional definition that includes a political or scale dimension to include urban, natural, desert, or jungle areas, among many others. The concept of region has been at the core of the French school of geography. Paul Vidal de la Blache (1845–1918), a French geographer, was the first to formalize the concept of region. It was for him a natural area that is translated in the landscape as the result of an inter-relationship between the natural environment and human activities. 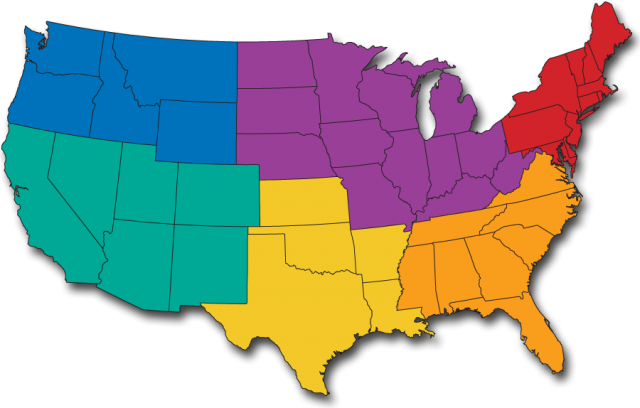 In the UNITED STATES, in the beginning of the 20th century, the evolution of the concept of regions changed to be recognized and used in practice. The administration of President Woodrow Wilson (1856–1924) chose Isaiah Bowman, director of the American Geographical Society and region expert, as territorial adviser at the Versailles Peace Conference concluding World War I. Geographers in Europe were consulted for the internal political reorganization in several countries. Traditional geography, that is to say, the descriptive taxonomy of regions, was criticized in the 1960s and led to new classification, such as the structural taxonomy making a differentiation between formal, functional, nodal, and equitable regions. The study of regions has been associated in geography with area-differentiation and chorology. The regions concerned here have distinguishable cores; however, the regional characteristics are losing their peculiarities with increasing distance from the core. David B. Grigg (1965) has examined the similarities between regionalization and classification and supported the regional taxonomy as the basis for formal region-building algorithms. On the contrary, the functional regions are concerned with the human organization of space. They are defined as areas in which a higher degree of mutual socioeconomic interactions exist within them than with outside areas. This functional geography joins the space of regional science. The nodal region merged in the 1950s, when Derwent Whittlesey (1954) developed the concept of cores and regional dominance in networks. Thus, the development of the different regions concepts from the 1950s has led to the importance of planning and the preparation and implementation of regional policy by practitioners and service providers. In the 1980s, nonfunctionalist formulations emerged and were linked to the renewed interest of the regions in the area of regional geography. Torsten Hagerstrand developed in spatial analysis the concept of time-geography to show the importance of the temporal variable in the constitution of space at different scales in the regions. Continuing on the ideas, Nigel Thrift has conceived the region as a “meeting place of human agency and social structure.” He is also inspired by Antony Giddens’s work (1984) on structuring theory. Allan Pred (1984), besides his schematic model of the region as process, has opened an approach to the Marxist geography particularly regarding the division of labor, layers of investment and the uneven development all these concepts accentuating the social practices developed above. It is interesting to note how the idea of regions can survive with the digital technology of information and communication and with the growing role of cities that offer opportunities for convenient meetings to the actors of the new economy in a global environment.